Hi everyone! 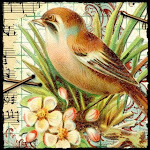 I hope you are enjoying our Spring event. 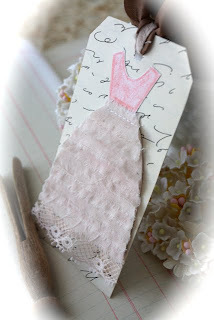 With Mother's Day quickly approaching I thought I would do a quick and easy gift tag tutorial! 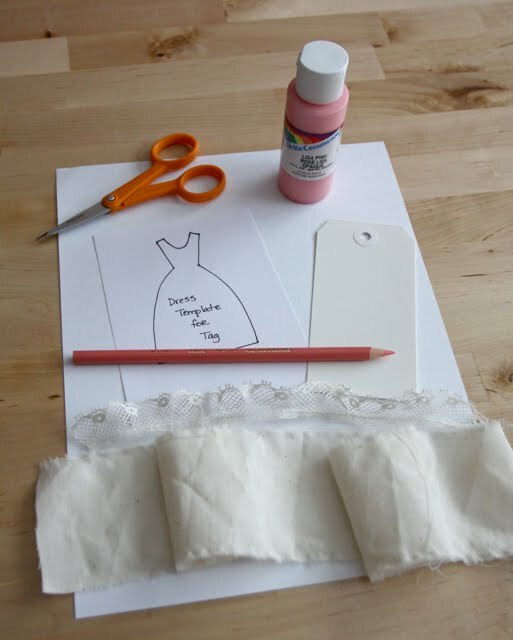 Step 1: We are going to give our muslin and lace a washed vintage look. 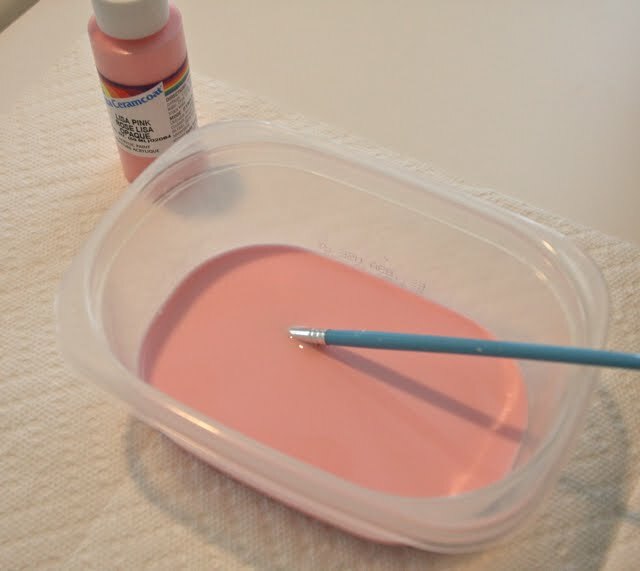 Mix a few squirts of paint with about a cup of water and mix. I just use recycled plastic containers. Be sure and protect your work area for this step. 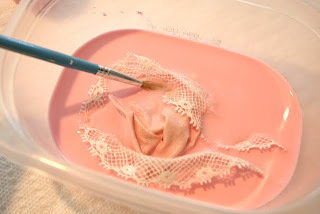 Step 2: Give your strip of muslin and piece of lace a good "paint bath". 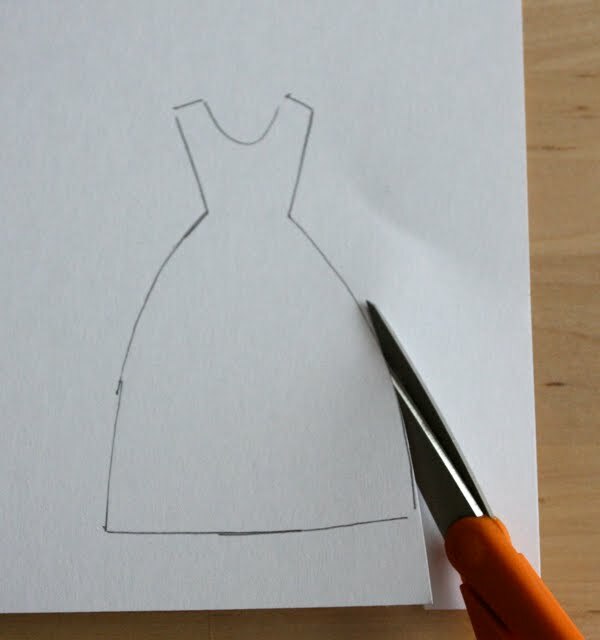 Step 4: Download the dress template HERE. 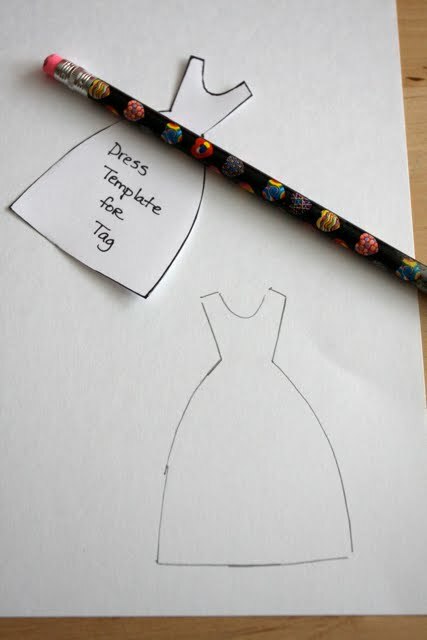 Print your dress template. Be sure and print full size. 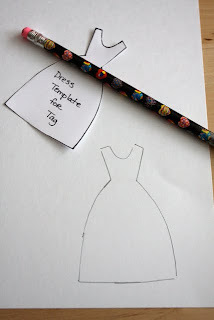 It should print the correct size for the tag. 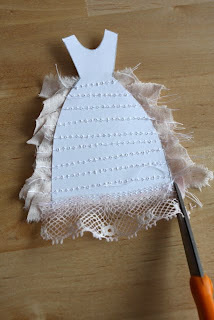 Then trace cut out and trace onto a piece of cardstock. 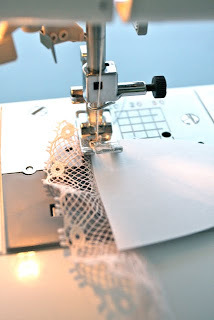 You could also print directly on cardstock. Step 5: Cut out your cardstock dress. 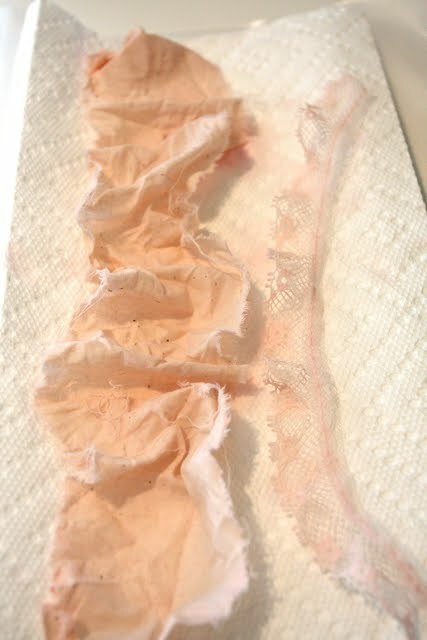 Step 6: Cut nips at the end of your muslin to make strips. I like my fabric frayed on the edges so I nip the fabric at the end as wide as I want my strip. Then I tear the fabric at the nip. 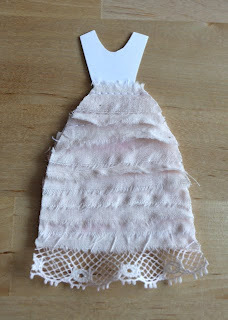 Step 7: Tear several strips of fabric for your dress. Step 8: Sew(or glue) your lace to the under side of the cardstock dress base at the bottom of the dress. Step 9: Sew (or glue) your strips of fabric to your cardstock dress base starting at the bottom of the dress and ending at the waist. 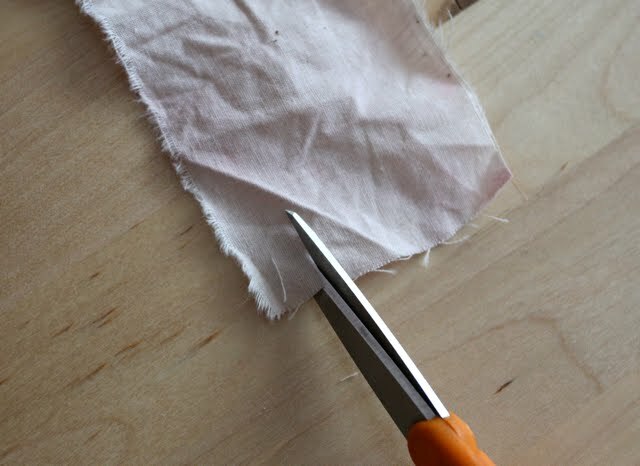 Overlap the strips as you go. If you don't want your stitching to show be sure and sew the strip at the top edge so you can overlap the next strip to cover the stitching. 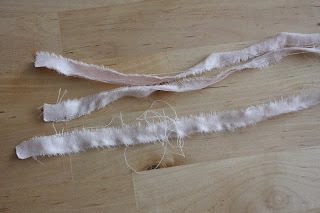 When finishing each strip just trim fabric and thread leaving an overlap. 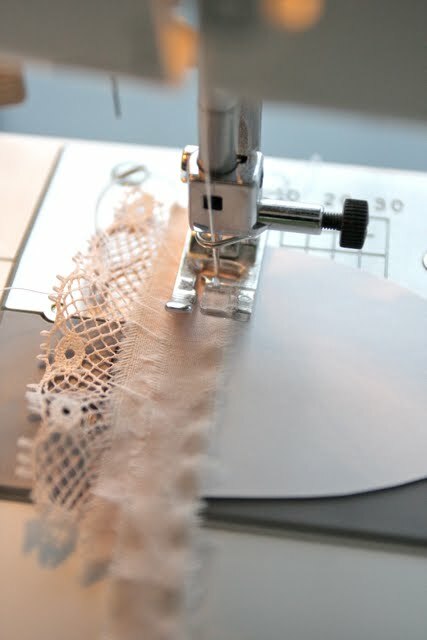 We will trim all the edges up after sewing. 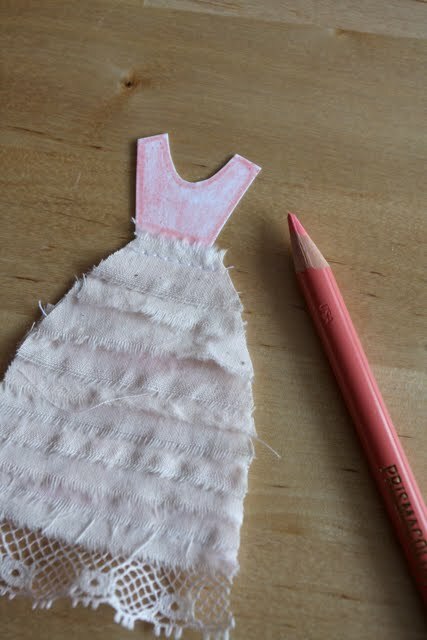 Step 10: Your dress should look like then when all the strips are sewed or glued. 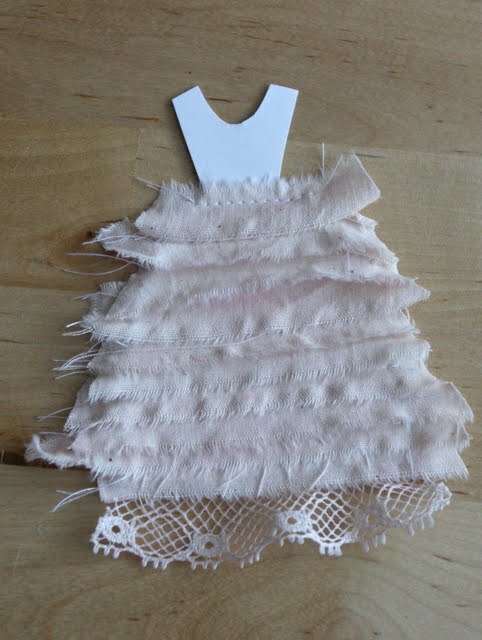 Step 11: Turn the dress over and trim the ends of the fabric and thread using the cardstock base as a guide for trimming. Step 12: Your dress should now look like this on the front. Step 13: Color the bodice of the dress with a colored pencil or maker. And you are done! 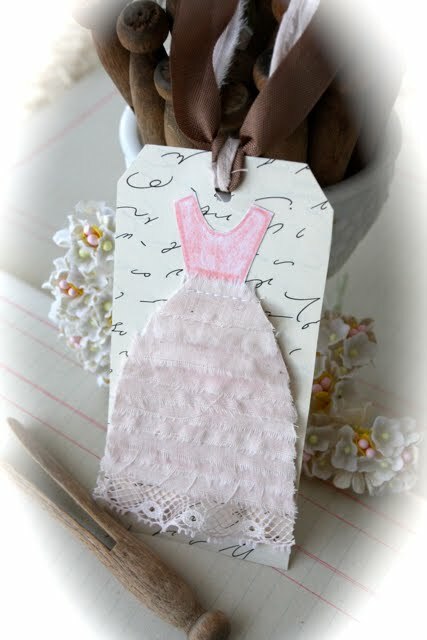 A cute tag to add to a Mother's Day gift or any gift! I hope you enjoyed the tutorial! 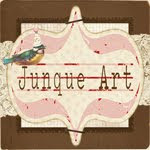 Be sure and share your tags in the Joli Flickr group! We always love to see what you create with the tutorials! What a great tag! Thanks for sharing the tutorial and downloads for it! How cute this is Cindy! I love it!!! I have never tried a paint bath before! Fun! I'll be doing that asap! I've used tea, kool-aid, coffee, food coloring, ink, etc...but never paint like this! 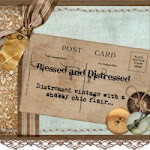 Fab idea my dear! Cute! Hope you had a great Mom's day! 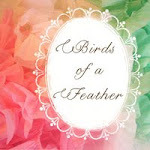 awesome ideas and a truly inspiring blog! 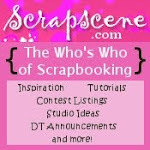 i am so glad i found you, thru WWC, a fabulous publication! i will be checking back often! This is lovely. Thanks for sharing.